Noah and Jude have been inseparable since birth. As twins they claim to share a soul and can feel the other’s pain. Noah is quiet and Jude is wild, but their complimenting personalities have kept them close. It’s Noah and Jude against the world, until they become strangers living in the same house. Noah tells his side of the story as a thirteen-year-old and Jude offers a sixteen-year-old's perspective, but their stories don’t paint the whole picture. Both use art to express themselves and art is the vehicle with which they try and mend their relationship. 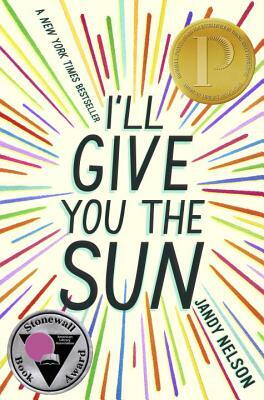 Jandy Nelson’s I’ll Give You The Sun is an expertly written piece on family, love, friendship, and art! "This is the big one—the blazing story of once inseparable twins whose lives are torn apart by tragedy." —Entertainment Weekly, "5 YA Novels to Watch Out For"